1 - 2 - 3 - 4 - 5 - 6 - 7 - 8 - 9 - 10 - 11 - 12 いろは - 13 カーニバル - 14 FEVER! Originally scheduled for release November 25th, but was delayed a day. This makes pop'n music éclale the first pop'n music game to have a delayed release since pop'n music 17 THE MOVIE, which was delayed a week due to an infinite credit glitch. Songs from éclale not present on the soundtrack were released as part of the pop'n music うさぎと猫と少年の夢 Original Soundtrack. "éclale" is a portmanteau of "éclat" (French for "shine") and "noble". Character selection screen was changed: green buttons are used to select character categories and the red button to confirm. This is similar to pop'n music 20 fantasia's character selection screen. Songs with jackets now feature their respective rival character for the song on the versus screen. pop'n Star Maker (ポップンスターメーカー) replaces Story Mode from pop'n music ラピストリア as the main unlock system. You can acquire character medals and lumina (ルミナ) on this mode. You can spend lumina on the Star Factory shop to purchase songs and decoration parts. EX charts for new songs (save for licenses) can be purchased on Star Factory as well. EXTRA STAGE, once again, is PASELI only, and works the same way as in ラピストリア; it is accessed by collecting the E-X-T-R-A letters. You get one letter each time you clear a song. You cannot play songs on EXTRA STAGE that you have not unlocked the charts of first on Star Factory. You can also buy letters for quicker access by paying 120 lumina a letter in Star Factory. First pop'n music game since pop'n music 16 PARTY♪ where not every new song has a Battle HYPER chart. The JUDGE+ modifier category is introduced. It includes the TIMING, LOST and PANIC options (previously, LOST and PANIC were OJAMAs). Song backgrounds for pre-pop'n music ラピストリア songs have returned, though MISS and FEVER backgrounds have not. All songs hidden in pop'n music Sunny Park and ラピストリア that weren't automatically unlocked in those games at some point are still hidden if not unlocked. They can be purchased in Star Factory. First pop'n music arcade game since Seiya Murai's debut with no brand-new song from him on the default songlist. First pop'n music arcade game since his debut with no pop'n music original song by Des-ROW. First pop'n music arcade game since pop'n music 12 いろは with no new song featuring mizuno and his wife akino. First pop'n music game since pop'n music 17 THE MOVIE with no original TAG song. All songs removed from the BEMANI category back in pop'n music Sunny Park have been put back on the category, now under a "BEMANI" sub-category inside it. Character design portraits no longer show any visible signs when they lose or win on the result screen, or have any facial animations. ラピストリア characters now show their WIN expressions on the songwheel. 2P palettes for new characters have to be unlocked by playing a round with the respective 1P palette of the character. The special 3P colors for pop'n music 18 せんごく列伝 to Sunny Park characters that the player had to input a code to unlock them are now unlocked by default (save for old songs that still have to be unlocked). The ラピストリア alternate portraits for HIUMI, FUGA, Rars, Ryuta, RINKA, and RETSU are also unlocked by default. Alternate portraits for ラピストリア's nia and toa were also added, the latter available by unlocking Hatcha Metcha Party. Song previews and staff comments for songs return on the éclale web site, after both being removed in ラピストリア's. Only KONAMI originals feature full staff comments, though. Contest songs only contain little blurbs from PON and wac. The game received an upgrade on March 22nd, 2016, featuring new backgrounds and music. A lot of songs got re-rated, too. LOCAL mode returned on April 14th, 2016. First pop'n music game since fantasia without a new level 50 chart. First pop'n music game since pop'n music 15 ADVENTURE with no proper end game song. With only 26 brand-new KONAMI originals created/commissioned specifically for the game, éclale has the smallest amount of non-contest original songs in an arcade version of pop'n music since pop'n music 8, which also had 26 brand-new songs. 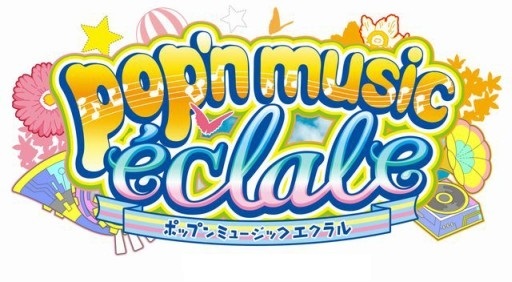 eAMUSEMENT support for pop'n music éclale ended on March 15th, 2017.
pop'n music éclale's OST booklet doesn't list any credits for the game. The following information is based on gathered information from staff comments. Star Factory is pop'n music éclale's shop, where players can spend lumina (ルミナ) to buy new songs, old event songs, EX charts, and decoration parts. For more information on requisites and prices, please see this page. The following songs were added on February 1st, 2016 to all players who completed the pop'n fuyu no stamp rally (ポップン冬のスタンプラリー) event, which started on December 24th, 2015. Both songs can be purchased in the Star Factory from March 10th, 2016. The Hinatabi chikuwa-hime ketteisen (日向美ちくわ姫決定戦) event started on February 24th, 2016 in GITADORA Tri-Boost, jubeat prop, MÚSECA, pop'n music éclale, and REFLEC BEAT VOLZZA. This event ended on December 1st, 2016. To unlock the following songs, players must raise the Chikuwa Gauge (ちくわゲージ) playing ひなビタ♪ songs. Do note that each song has its own Chikuwa Gauge, and that the songs must be unlocked on each participant game (progress does not carry over to other games). Solo songs will raise 2/3 of the Gauge for the character featured on the song. Duet songs will raise 1/3 of the Gauge for both characters featured. Group songs will raise 1/8 of the Gauge for all five characters. From February 24th to March 16th, 2016, players could vote for one of the 日向美ビタースイーツ♪ members in order to get her respective cover song from the Five Drops albums into each participant game. Players had to get a Membership Card by introducing a serial code given on the respective member's Five Drops album, or by filling the respective Chikuwa Gauge of the member on at least two games, and then collect chikuwa by playing 日向美ビタースイーツ♪ songs or by voting on the event website once per day. The winner, Rin Shimotsuki, was announced on March 16th, 2016. Her cover song 黒髪乱れし修羅となりて～凛 edition～ was added on April 18th, 2016. By playing SOUND VOLTEX III GRAVITY WARS, the player will raise the infection level and unlock the following songs from the SOUND VOLTEX series during the respective periods. For more information on the event, see its own page. BABY P PANIC POP pop'n music 14 FEVER! This page was last edited on 1 April 2019, at 14:21.